Eco blogs are a great resource for anyone who’s looking for ways to create a more sustainable lifestyle. There are tons of eco blogs out there, but some stand out from the rest because of their creativity and devotion to helping their readers live a greener lifestyle. Our picks for the top eco blogs of 2017 include blogs that help you save money while going green, blogs that provide eco-living tips for the whole family, and blogs that feature tutorials for eco-friendly crafts. If you’re looking for tips on how to live greener, these blogs will help you. Back to Calley is run by Calley Pate, an eco-friendly blogger who writes about parenting and green living. On her website, you’ll find blog posts about everything from natural cleaning methods to natural parenting to healthy recipe ideas. Plus, she has some great ideas for sustainable baby showers. She’s also an expert on cloth diapers, and she has a whole section on her website devoted to them. Back to Calley features an eclectic mix of blog posts that will all help you live more sustainably. If you’re looking for eco-friendly art projects to do with your kids, head over to Crafting a Green World. They have tutorials for creating cute DIY natural toys and baby gear. They also have some fun craft ideas for adults, including DIY home decor, wedding accessories, bath products, and homemade clothing. Crafting a Green World also has a great section on how to reuse items like zippers, Altoid tins, old gift cards, glass jars, plastic bottles, pill bottles, and curtain shower liners. These guides will help you find creative ways to upcycle items you would have otherwise recycled or thrown out. Crafting a Green World is the perfect place to go if you want to unleash your crafty side. Big Green Purse helps you find ways to shop greener. The woman who runs the blog, Diane MacEachern, is an entrepreneur and author who has written extensively on green shopping. On her blog, Diane shows readers easy ways to spend less while buying items that are good for the environment. If you’re looking for the best eco-friendly ways to shop, Diane’s green shopping principles guide is a good place to start. Big Green Purse also has guides to thrift shopping, shopping organic, and more. Big Green Purse also has extensive sections on green living, taking green vacations, and organic gardening. If you’re looking for eco blogs that will help save you money and be more eco-friendly, Big Green Purse is a good choice for you. Saved by Grace is run by Christine Tolhurst, a mom who loves to shares her knowledge about eco-living, fitness, and travel. She often blogs about her favorite healthy recipes, and she loves sharing her new DIY projects and crafts. She also makes many of her own beauty products using natural ingredients. Some of her past projects include hemp and milk bath bombs and gorgeous gemstone soaps. Christine’s blog is the perfect place to go if you’re looking for some new recipes and projects to try out. Zero Waste Home is run by Bea Johnson, a zero waste expert. Bea’s family decided to go zero waste in 2008. Since then, her family of four has produced less than a quart of garbage each year. Bea shares tips and tricks for living the zero waste lifestyle on her blog. She also has posts on how to find multi-functional items, which are essential in zero waste homes. Zero Waste Home is the perfect blog to read if you want to produce less waste and recycle more in your home. On The Eco Friendly Family, you’ll find loads of information about how to create a green lifestyle in your home. Amanda Hearn, the author of the blog, shares stories from her own family, and she also gives general tips on how to live greener in your day-to-day life. On the website, you’ll find blog posts on cloth diapers, different recipe ideas, and ways to create a healthier home. Amanda also has tutorials for making your own non-toxic DIY cleaners. She has videos and blog posts that will teach you how to make detergent, all-purpose cleaners, and soaps. Plus, she also offers easy-to-use tips for conserving water and composting. The Eco Friendly Family is a great blog for anyone who’s looking for simple ways to make their house a little greener. Green Living Guy is run by Seth Leitman, and it’s the place to go if you want to learn the latest in green news. He has blog posts on everything from luxury eco-resorts to the newest types of solar and wind power. Seth also has plenty of blog posts with tips for making your house eco-friendly. This includes blog posts on planning eco-friendly basement renovations and posts that give small, simple ways to make your house a bit greener. Happy Healthy Mama features posts on natural living, fitness, and parenting. Maryea, the woman behind Happy Healthy Mama, is not afraid to discuss what’s on her mind, and she writes some beautiful and frank blog posts about being a mom. These posts discuss things like what Maryea wants her daughter to know about her body and how not lose yourself in motherhood. Happy Healthy Mama also has some healthy recipes that are easy to make and absolutely delicious. This blog offers a mix of personal and how-to blog posts that are all fascinating to read. 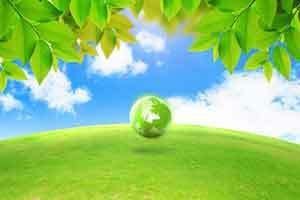 Eco blogs are an amazing resource for anyone who wants to go green. These blogs offer everything from DIY all-natural crafts and beauty products to ideas for kid-friendly recipes. The blogs are also great guides to use when you’re making environmentally-friendly changes in your life. Read through some of these blogs, and begin using their tips to create a greener lifestyle in your home.